Corruption in Papua New Guinea is widely accepted to be a major development challenge. The fight against it was recently bolstered by the introduction of a new anti-corruption taskforce. In 2011 Taskforce Sweep, a multi-agency anti-corruption taskforce, was set up by Prime Minister Peter O’Neill to investigate, prosecute and recover the proceeds of crime. The agency was initially successful in recouping corrupt funds, instigating numerous arrests and prosecuting a senior politician. But in 2014 Prime Minister O’Neill ordered the agency disbanded after O’Neill himself was served with an arrest warrant over his alleged role in a corruption scandal. While the legality of the PM’s decision is being decided in the courts, Taskforce Sweep continues to operate in an increasingly difficult environment. 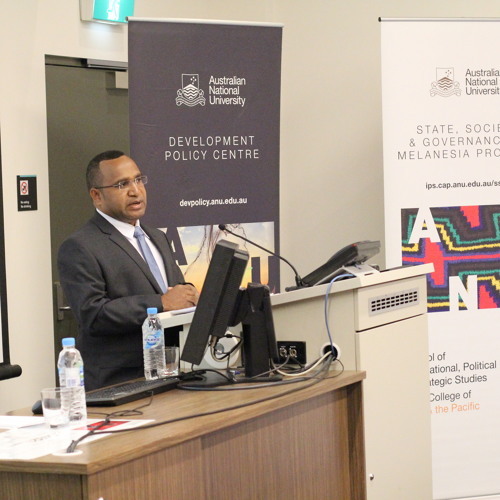 In this presentation, the Chairman of Taskforce Sweep, Sam Koim, reflected upon his experiences in fighting corruption in PNG. He explained the institutional arrangements that led to Sweep’s initial success and outline the issues that threaten these arrangements. The presentation highlighted what these challenges mean for ongoing anti-corruption efforts in the country.